This is a custom made frame. It is approximately 20 inches by 15 inches. 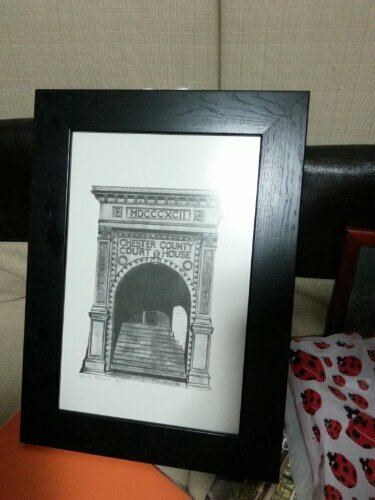 It is not a real wooden frame. Wood is much more expensive and harder to find. But it looks like real wood and the frame is about 2.5 inches wide. Why do I like it so much? It cost only 25 Turkish lira. That’s about $11 for a custom made frame! Not the $150 it would have cost in the States for the same. I agree on most! I do have a hard time finding clothes that fit and look good on me though. I’m too tall and end up buying men’s jeans. The rest I get at home. I love that i can get my teeth cleaned at the university for no charge! And I love that I can get my hair blown dry in no time and for practically no cost. The cuts . . . that’s a different story for me. My daughter and I both had a good haircut today, and she also had her eyebrows shaped -While I was waiting for her complicated cut to be blow dried, I read 3 English magazines and drank two glasses of tea. Total cost 36TL.
. . . and in so many ways!